‘Climate Change Denial’ is a useful book and resource for those with an open mind – for instance journalists. It reads easy and provides a fairly concise picture of the situation many of climate scientists have to live with. The book makes many good points, but I’d like to add some of my own thoughts. Many of the deniers dress up in a scientific cloak, but if the criteria of science is Replicability (‘R’), Objectivity (‘O’), and Transparency (‘T’) (remember ‘ROT’), then any rotten argument should easily be discarded. If there is any substance to the counter claims, then there should be no problem replicating these with objective methods, and similar data (science is only interesting if the results are universal). I have tried to get some denialists to show me their method and data, but end up being told that I’m stupid. One problem is that there is no good public stage for evaluating claims by applying ROT – Internet is just too vast and disorganized, in addition to being limited to people active on the Internet. But books as this are one contribution to examining the claims. ”Climate Change Denial’ discusses the most common set of denial arguments. When Washington and Cook address the precautionary principle, they provide some examples. They could equally have mentioned that the precautionary principle is used very selectively and inconsistently – such as WMD in Iraq. I think the discussion about the scientific method, consensus, and basic climate science may be useful for many readers. The book explains that consensus arises when there is a most convincing explanation for the conditions we see – this is often twisted and put on its head, and denialists think that the explanation follows the consensus, exposing ignorance about fundamental aspects of science. One of my own favorite criticisms of the deniers is their use of dogmatic reference to various texts (described as “cherry picked” in the book) and repeat this claim over and over again. Although repeating it doesn’t make it more true, it’s a cunning way to drive in their message in people’s mind – just like cramming or training. This behavior also shows that there is no dialogue, as any counter argument is almost with out exception neglected. This in addition to making completely illogical connections. The discussion about the climate science is fairly brief, but I think that the book would have been even more convincing by citing more broadly, rather than keeping referring to a handful of central people. It would be good to show the vast volume of work done in climate science supporting the concept of AGW, as some names (and the IPCC) are getting a bit worn over time through having their work (only) seemingly tarnished by the denialist camp. The discussion about feedbacks provides a useful list of amplifying or dampening mechanisms playing a role for an AGW, but I missed three dampening feedbacks. Furthermore, ‘negative’ feedbacks in various systems work may be either through reducing the effect of an initial forcing (the black body feedback, lapse rate feedback), or by keeping the state near an optimal state (oscillator, ‘Gaia’-hypothesis, thermostat-type). For either case of negative feedback, I think it would be a challenge to explain how a planet could sustain a GHE if you consider one with no atmosphere and gradually add a greenhouse gas. This way of analysing the situation is a bit similar to some approaches for solving physics problems, such as estimating the velocity of satellites around the earth by assuming that it’s initially very (infinitely) far away and assuming that loss in potential energy equals gain in kinetic energy. Similarly, if the earth starts with as little atmosphere as the moon, and that it gradually gets thicker and more extensive, how sensitive would the surface temperature be to the gas concentrations if the sensitivity was very low? Or does the fact that earth’s surface is about 30C warmer than if it had no atmosphere mean a more substantial sensitivity – even when the forcing is proportional to the logarithm of the CO2 concentrations? And what about Venus’ hot surface? Some feedbacks are non-linear, and some act with a time delay (in many systems, that often gives rise to spontaneous fluctuations). I found it surprising that the book discussed a runaway greenhouse effect, but this concept is hardly being discussed – as far as I know – in the research community. Again, I think the book draws on a small number of scientists. Washington and Cook refer to two studies demonstrating the different view of AGW in the climate research community and the general public. Whereas 97.5% of the (active) climate research community thinks AGW is a real problem (Doran and Zimmerman, 2009), only 58% (Gallup, 2009) of the general society shares this view. This is a really serious situation of great concern. They also list a number of reasons why this may be so. I think they do have a point, but I also think that there are other reasons too. In fact, I wonder if this is not what one would expect, given the circumstances? This question is relevant for their discussion of the ‘deficit model‘. The question is whether the society’s knowledge about AGW is really the major hirdle – which Washington and Cook argue that may not be so, but rather due to our denial. On the other hand, the amount of effort and work dedicated into communicating our knowledge about our climate has been really tiny! Most scientists are mainly doing other things. Communication has perhaps not been sufficiently valued and not been regarded as an important job. Such activities have in the past not been well coordinated and may have suffered from lack of collaboration, as many scientists often compete with one another for the same funding. In other words, too little resources, too little collaboration, and lack of training (The IPCC report do not reach the masses, but seem to be written by scientist for scientists). The present situation also suggests that the denial campaign have been hugely successful – due to a well-funded propaganda campaign according to Oreskes and Conway. Communication is probably more important than we think – just consider the fuzz around “Climategate”, Wikileaks, Al Jazeera, and the effect of social media in recent days in North Africa. Although not said explicitly in the book, science must become more ‘domesticated’ in order to make progress. 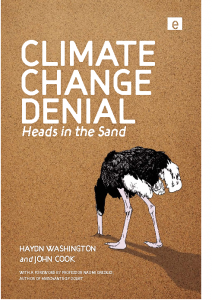 ‘Climate Change Denial: Heads in the Sand‘ is a step in this direction. Science should be something that everybody feel an ownership to and that is relevant for everybody, not just the elite (this is discussed in more detail by Chris Mooney). The deniers campaign may have been successful at increasing the gap between science and the society even further. There is also the fact that way too little has been done regarding mitigation and adaptation, and too few people work with these issues. So when top politicians travel around to international climate summits, but provide little funding for work on mitigation and adaptation – that really is double communication. Washington and Cook call it ‘governmental denial’. I see some irony in this – at a recent conference (Carbononiums), the Norwegian minister of environment denied that the AGW-deniers matter, as well as that any influential politician denies AGW. The last part of the book discusses economy, philosophy, politics, and solutions to the climate problem. I think that this part compliments a similar discussion in Paul Epstein and Dan Ferber’s recent book ‘Changing Planet, Changing Health‘, as I don’t think their list is completely exhaustive. Their message about philosophy seems to be that post-modernism has been widely misunderstood, and I gather that too many journalists have got too strong a dose of post-modernism in their journalism education (balance aspect). What is really needed, I guess, is that they keep in mind ROT and try to examine the evidence for the different views. Basically, do some work rather than just reporting the disagreement in a superficial fashion. I’d urge journalists to act more like detectives and examine the logic of the claims- what is really behind the argument? I can’t imagine post-modern detectives and lawyers. The book also discusses overpopulation and geo-engineering – for more detailed discussion on the latter, I’d recommend Flemmings recent book ‘Fixing the sky’. Regarding overpopulation, Washington and Cook refer to Paul Ehrlich’s book form 1968 ‘The Population Bomb’, and states that the impact from overpopulation is the product of population × affluence × technology. The validity and usefulness of this equation is debatable. The last chapters in Washington and Cook book provide a more subjective and compassionate discussion about climate change – which I think also is important. They argue about the urgency in fixing the world’s climate and environmental problem, and suggest a number of solutions, and touch upon the materialistic values (a bit like TheStoryofStuff), and discuss the need to reset our values (perhaps a bit like “Yes Men fix the world“). Their views are sure to cause provocation in some quarters. Nevertheless, I think that these chapters provide a nice complementation to some of the discussion provided in Epstein and Ferber’s book, who also discuss things like wedges, smart power nets, etc. None of these books discuss possible ‘multiplicative effects’, where several factors proportionally increase the effect. For instance, if more effective cars only use 70% of fuel, the portion of fossil sources for energy use is adjusted down to 80%, smart planning and collaboration results in 4 people in each car (say 30%), and a ‘smart’ organization of the working week means less commuting (80%; TGIT), then combined effect of this can in theory give a reduction by 0.7 x 0.8 x 0.3 x 0.8 = 0.13. Likewise, a combination of increased efficiency at both ends of energy production and consumption can in principle result in an enhanced mitigating effect. Washington and Cook argue that we really need to get on with this work, as the AGW problem is an urgent problem: The longer we wait – the worse the situation. It was “climatologists”–well, glaciologists–who pointed out Himalayagate. I’m admittedly not very familiar with the other cases cited, but on the face of it only the arctic.net example has a timeline associated with it. (And it’s so far out of the mainstream that it’s valueless as an exemplar.) At that, did arctic.net really predict it–that is, say it WOULD happen–or merely say that it COULD happen? I’ve repeatedly noted denialists similarly misrepresenting what various people have said–for example, on hurricanes I could name an individual who repeatedly insists that the few quiet hurricane years we’ve had recently somehow ‘falsify’ the prediction that we will see fewer, but more intense tropical cyclones–never mind that that prediction refers to the whole twenty-first century! Or take Himalayagate–an embarrassing error, to be sure, but an (egregiously) wrong melt date for one region becomes a much-repeated claim that “the UN lied about melting glaciers.” Never mind that the bulk of what was said about glaciers was quite correct and well-supported. This claim that ‘exaggerrating climatologists’ are to blame is particularly galling in view of the fact that the IPCC under Dr. Bert Bolin deliberately cultivated a culture of great conservatism in their claims, precisely in order to safeguard their credibility. This was a principled and well-intended stance, but in hindsight you have to wonder–the denial machine has had considerable success by systematically misrepresenting the IPCC–and many of the worst-case scenarios the IPCC eschewed in their conservatism remain pretty much off most people’s radar. The data from Munich Re carries far more weight with me than all the anecdotal evidence on your long list. your list of reasons is essentially versions of misdirected mistrust of science and misplaced trust of other sources and their unfounded claims. The cost of business as usual (BAU) is far greater. The cost of climate disruption will be the enormous cost. If we continue burning carbon as you wish, atmospheric CO2 will easily go above 550 ppm. How high was sea level the last time that happened? Meanwhile we do not acknowledge the costs of carbon based energy. The pollution, environmental and health costs of coal, it faced, would make it much more expensive than its official price. Oil brings pollution, foreign dependence, and is a factor in our troubled relationship with the middle east. Chalk up some of the defense budget to oil. Second, blame China … so all is vanity. No, the US must act and lead. Saying others must go first is the road to destruction. Future models will be plug-in optional electric. Electric cars, and decarbonizing the grid plus roof top or backyard solar power will help plenty. It is basic knowledge that a combination of 15 or so fairly large moves will be needed to do what we should do, so of course no one move is the whole solution. This is displayed nicely in a pie chart of 15 wedges somewhere. Note that all that “all is vanity” stuff serves the interests of Big Carbon (and is a collection of bad arguments). Speak for yourself. Scientists understand climate quite well enough to know that continuing with BAU is folly. Then: a misguided statement about “preposterous claims.” That’s just a slur based on not knowing science. Most commenters here at least read research papers. It is true that the denial industry uses incorrect statements (often made up by them) to push false doubt. What you may not know is the deniers make preposterous claims over and over, and little else. Then a crack about Al Gore. I didn’t take it as meant to be a real quote. I don’t think that matters for your argument. Just saying his name refutes atmospheric science in the view of some. Learn science and your appreciation for him will grow. But if you are among those who can not reason well when his name is used, do yourself a favor and leave him out of your deliberations. Consider that the chance that you are right and physics is wrong is nil. Then consider that if you are wrong, and your consul to do nothing is heeded, the human cost will be extreme. And consider that although there is initial cost to replacing old power plants with renewable energy, we will be better off when it is done. Can you in fairness still consul no action? Ah yes, the human gnome project. Is this the one where we were trying to breed a shorter race of humans to live in underground caves in case the surface becomes uninhabitable? Republican factory owners killed your family and friends in the catastrophic blizzards, floods, tornadoes, massive wildfires and other climate change that has been wiping out the bible-belt. This is the Climate Change that their factories created. This is the Climate Change that the Republicans lie about not existing. This is the Climate Change that they program their constituents to deny exists. This is the Climate Change that killed people, destroyed homes, further destroyed the economy that the Republican factories emissions caused so they could make profits by killing those people. Republicans deny Climate Change at all costs in order to keep their factories from having to pay to stop it. The Climate Change that is destroying massive pats of our country can no longer be hidden or denied. First, argument from consequences is a logical fallacy. Second: risk analysis–YER DOIN’ IT WRONG! What matters is the risk versus the cost of mitigation. If the risk (probability x consequences) is high, we should be mitigating even low-probability threats. b)–Newsflash, bucko. Energy!=CO2. And if the US comes up with a solution, that’s a billion Chinese who will be our customers! You don’t think? Well fortunately, you don’t have to. You could look at the fricking evidence–which is pretty overwhelming. 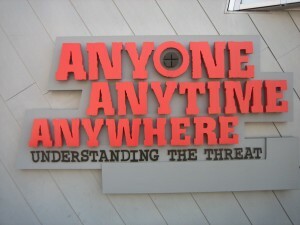 And NOT understanding the threat is even worse! It makes it all that much more imperative to act, because we can’t bound the risk. e)–again,  Look at the top of this page. See, in the middle. Data Sources. Knock yourself out! f)–Dude, your entire spiel consists of preposterous claims and slanderous inuendo. Oh and there it is, the ubiquitous Al Gore is fat fallacy. Bingo! g)Great logic. You don’t think we can do anything, so you’ll sell your kids’ futures down the river. And as to nukes–we have some lively debates on that here. We have some anti-nuke commenters, some pro-nuke commenters, and I am neutral. Now maybe if you want to turn off Faux News and their lies for a few hours, you can come back and learn something real about Earth’s climate–  Freakin’ Mahalo. Denial is a sign of fear. People who keep on denying the reality of climate change are like burying their heads under sand trying to escape from the reality of life. Whether they like it or not our climate has really change not just based on an unproven theory but based on scientifically proven reality. “the human gnome project”? Is that funded by Travelocity? Against my better judgment, I thought I’d weigh in on the skeptic record using OK Skeptic’s #141 as a reference. a) The cost to do anything about it is enormous, hence a high degree of certainty is required. This is very valid, though the enormity of the cost per se is not a reason for being skeptical. But if there is skepticism with part of the science to begin with, the enormous cost is reason for demanding extreme scientific rationale to mitigate the skepticism. While I understand the risk analysis Ray describes, it becomes ethereal in this situation: in the extreme it approaches an infinite cost of BAU which means GW must be stopped even if its probability is zero. Non-interesting answer as mathematicians would say. This is not a justification for skepticism. In fact it seems to assume GW as a premise, but as it’s ‘too big to fight’ we should just enjoy what we can till we all die. Seems a no-op. This is solid justification for skepticism as long as one can delineate the area of the science where skepticism might be warranted. I would quibble with the wording: I think there is a “great” understanding of the science; I don’t think there is a “complete” understanding enough in some areas. As a sidebar, a skeptic need not prove the science behind his skepticism, but just have reasonable scientific doubts. I think the huge emotional component hurts greatly the effort to convince the skeptic otherwise, but again I don’t think this is cause per se for skepticism in the first place. Nefarious and suspicious looking activity doesn’t help either, though I think this is a very small portion of the “emotional” response, which is mainly a result of their feeling strongly about what they think they know. Actually I think “emotion” is not the best word her. Hyperbolic, strident, even alarming might be more apt, and is the cause of this problem, as in Dan H’s #145 (ignoring for the moment the ubiquitous retort that ‘they never said that…’). f) IPCC, greens, and others have made preposterous claims, which in the end has probably alienated people from the global warming cause. This is true as I implied above. But – semantics – this is more a reason for remaining skeptical than being skeptical. Also, to clarify ala rasmus, preposterous claims is an individual thing and not a constant homogeneous activity across all warmists (scientists or not). This all seemed better in my mind than it does on paper. Sorry. Must be my non-evolved reptilian brain (stem)! The stridently alarmist, hyperbolic, scare-mongering exaggerations of the supposed “enormity of the cost” of phasing out fossil fuels, which do not stand up to impartial scrutiny, are indeed good reason to be skeptical of denialists who call themselves “skeptics”. Some stereotypes refuse to die. Along with the book reviewed above, I also ordered Gavin’s Climate Change: Picturing the Science, which looks as great as advertised. I know this because it was DHL’d down to my corner of Europe by Deutsche Post, so it came up my stairs at a brisk trot yesterday morning, whereas Cook & Washington got shipped by Royal Mail, and I’ve been told to expect it by… 31 May. Fog in the Channel, perhaps? Meanwhile, Risto’s comment earlier got me started on Stewart Brand’s manifesto. (That one took 45 seconds from order to delivery. The instant gratification of e-books suckers that lizard brainstem of mine into buying stuff I’d never go to a bookstore to find. Authors and publishers, take note.) If it’s not too off-topic, I might offer some impressions of that later on, since I clearly won’t get to do a reader review of Heads in the Sand. Rod B., Your comment(160) was pretty good. You do seem to suffer from a misimpression as to the costs of mitigating climate change–we are talking a few percent of GDP at most. This is quite doable. However, fossil fuel interests (especially coal) are big losers in this, so they will never agree. Horse puckey, as Ray would say. Let’s take it point by point. a) The cost to do anything about it is enormous. . .
Counterfactual premise. There is whole range of possible responses between “enormous” and “nothing.” The adequacy of possible responses is a valid concern, but sometimes a partial payment is very much better than none. b) The US can’t do much about it anyway. The US, like every other nation, is responsible for its own emissions mess. It can do the right thing, or not. What anyone else does is beside the point from an ethical point of view. Clearly, OK was speaking for himself there. d) There seems to be a huge emotional component to some AGW scientists. . .
Nostalgic for the ’50s, when scientists were (supposedly) emotionless robots? Even they got a little emotional when the Blob threatened to eat their lab. . . which is a flippant way of hinting that, if someone (James Hansen, say) believes that their children’s or grandchildren’s welfare is at risk, they are apt to respond with a little bit more than nonchalance. This idea of ’emotional’ scientists begs the question: Where does the emotion come from? If you ask them (and who is a better authority on *their* emotions?) they say it proceeds from an existential threat that is hanging over our future. Is it plausible that someone like Dr. Hansen, who has had an enormously successful career by any reasonable standard, is getting anxious about where his next grant is coming from? Get real! If OK wants to look at data, I personally can point him to numerous sources online for climate data. And others here–just as much amateurs as I am–are much handier at it. Name one other field that has this kind of data availability for the public. I bet OK can’t! f) IPCC, greens, and others have made preposterous claims. . . Substantially untrue. Yes, there was the embarrassing gaffe of “Himalayagate.” But that was one factoid in thousands of pages. On balance, as I stated above, the IPCC has been extremely restrained in what has been claimed. Have there been advocacy groups who have gone over the top at times? Sure. There was an instance quite recently where RC called out a group for just that. g) As I don’t think there is much that can be done about it. . .
Actually, as I read Rod’s response on this point, it becomes clear to me that he was disagreeing with OK way back in b). Anyway, OK’s statement strikes me as, frankly, spineless. It’s one thing to say that nothing *should* be done because the threat isn’t real. That’s not supportable by the evidence we have, but at least it’s consistent. But ‘nothing can be done so I’m not going to care’ is a purely self-protective emotional response. Denial is very human. It’s a defence that we all use, and as a card-carrying human, I’m copping to it right here, right now. But human as it is, and necessary as it may seem to be from some perspectives, it’s anything but admirable. Let’s remember that many people have died because they made the choice to protect their psychological comfort by using denial BEFORE protecting their physical safety! That’s a sad fact often stressed in the early stages of survival training. Step one in doing well in a survival situation is recognizing that that’s what you are dealing with. That’s why courage is not only a virtue, but adaptive. That’s why it’s also an important part of our human heritage. And I think that we need it now, more than ever. “no-op” is an old computer command which in essence tells the computer that while it always has to run its cycle, the next cycle has nothing of importance or interest to do, so do ‘no operation.’ Mostly used in conversations than code, though, because the nerds thought it cool. Ray, a few percent of GDP (if that’s what it is) can be a huge number. Nor does an “enormous cost” exclude “doability. But I was trying to describe skepticism, not debate substance. Some mitigation costs can be enormous (and some not) and a few might deny the amount or not care, and that subset combo can cause people to question the veracity of what that subset/person says – in the vein, ‘ if he’s clearly full of nonsense here, why should I believe his AGW science words.’ Just one possible cause of skepticism. Edward Greisch #60: conservation in evolution does not necessarily conserve function. There are parts of the genome that have been conserved for millions of years that have very different functions in different organisms, and the same applies to macroscopic features. That’s why phylogenetic analysis works best with similar species. All that’s required for conservation to apply is that a feature has some function; the human appendix may well disappear given enough time because its absence doesn’t confer any advantage. But the again, whatever encodes for it in the genome may also encode something else. The “reptilian brain” is in any case an outdated concept, though it makes for great rhetoric. If you don’t like reptiles. There is an all out war on science going on. Schools in the US are threatening that the teaching of global warming must include ‘conservative’ (i.e. denial) views. Denial is a Freudian defence mechanism, it is just one of the defence mechanism employed by those who refuse to face up to climate change (look up psych defense mechanisms on Wiki). Projection is another in that climate change is a ‘liberal’ conspiracy. Deniers do not question other areas of science (such as plate tectonics unless they are flat earthers). They concentrate on the areas of science they cannot face up to (or where they can win influence over others by pretending they agree with the deniers). Of course the motive for denial with evolution is that to not deny it is to think that creationism is wrong. The motive for denying global warming is that everyone fears greater interference with our daily lives by government (fuel taxes and other restrictions on fossil fuel usage). None of those things change the fact that global warming is true (to boot … global warming does not care about the opinions of humans either). bom.gov.au = Bureau of Meterological Anecdotes? nasa.gov = National Aeronautics and Space Anecdotes? atmos.uiuc.edu = Anecdotal Tales of Meteorological Observations at UIUC? grid.unep.ch = UNEP Division of Early Warning and Anecdotes? ucar.edu = University of Colorado Anecdotal Research division? climateprogress.org = blog of MIT physicist and former Acting Assistant Secretary of the U.S. Department of Energy, in charge of the Office of Energy Efficiency and Renewable Anecdotes? Kevin, In computing no-op is short for no operation. It’s a computer command where the CPU goes through a time cycle without doing anything. 167 Philip Machanick: True. I don’t like ceremonies. Ceremonies are reptilian stereotyped behavior. So what? I was explaining the term for the young people. So how do you explain the human propensity to denialism? And how do you fix it? Dividing the brain into 3 parts is sometimes useful. Newtonian mechanics is still useful too. On the 21st of this month, the Rapture is predicted to happen. Since it won’t happen, the believers will believe it all the more because they gave away everything they own. How do you cure that? Is there a drug or a therapy that works? It would be a starting point to deal with GW denialists. So far, we don’t have much of a handle on either problem, if any. We may as well continue talking about reptile brains or future evolution. 157 Valerio: “Denial is a sign of fear.” Yes, perhaps it is. Suggestions? How about putting a tranquilizing gas into the air? Not. But we need to get creative. Denial is like panic: human emotional reactions that are not useful and are in fact counter-productive and maladaptive. So, what is the medication for panic attacks? How can we prescribe some for everybody in the US? Somebody on medication for panic attacks please tell us the name of the medicine. 141 OK Skeptic: “The cost to do anything about it is enormous,” The cost of doing nothing could be infinite: it could cause the extinction of Homo Sap. The cost of doing nothing will at least be far larger than you could possibly imagine. The collapse of civilization or a population crash are very likely. By population crash, I mean the starvation deaths of Billions, not millions, of people. Hang around a while and we will tell you more about that. “hence a high degree of certainty is required. ” We have that certainty. I’ve got some LED nightlights that, after 10 years or so, are pretty clearly on the right-hand slope, and look distinctly patchy! A technically astute buddy of mine pointed out yesterday, though, that LEDs last the best when not subjected to over-voltages–which reminds us that reliability isn’t just a function of the basic technology, but also of usage, design, and operating environment. I’ve been following this thread, hoping for a little more insight to the authors’ meaning in the phrase above. As a developmental/behavioral pediatrician, I deal with all kinds of behavior in all kinds of people, most of whom have had brain injury as children. In the several fields making up behavioral science, we have our own conflicts and doubters. Without knowing how the authors have built their case (may have to read the book? ), it is hard to argue causes for denial. The brainstem as source is at least oversimplified, with maybe a few nuggets of truth. Unfortunately, the science in my specialty area is its own kind of obscure. Everybody has theories about the behavior of others, and ‘facts’ come at us from all over the place, but very little as “hard” data. Personal experience remains the best clinical resource, and story telling is often the most effective route toward changing target behaviors. I’ve a pile of favorite soundbites for those clinical discussions, including some that fit here. Medicine is supposed to be “evidence-based”, just like the scientific method should drive the climatologists who do the work behind IPCC, Real Climate. However, when the discussion gets too close to home, or too far from a personal agenda, many people find ways to deny the science. When a psychiatrist rejects my diagnosis of fetal alcohol syndrome in a child because “FAS is over-diagnosed; a little alcohol never hurt anyone”, he is practicing “faith-based” medicine, by personal belief, while ignoring the available scientific data that has accumulated to overwhelm any doubt. These days of Fox News and talk radio, the message is clear: “If a scientific statement or theory is inconvenient, then choose one you like better”. Scientific method to discover truths is made equivalent to Evangelical Lutheranism, as just one of many other belief systems. Individuals make conscious decisions about beliefs, using cortical synapses, which function to over-ride and direct more automatic parts of brain, such as the brainstem. The chosen beliefs then direct the programs which run the hardware. When Dan H, one more time, trots out “CO2 is no pollutant”, in spite of the repeated, exhaustive destruction of his every argument, he is operating from a “faith-based” view of the world. He has programmed his brain to a reality where the “science” of RC is not at all relevant; his reflexive brain pathways are allowed to treat each new thread as just another opportunity to post more misinformation and already disproved claims, because “truth” is that relative thing. My take: There is apparently a large segment of humanity which conflates being dogmatic with being principled. Being rooted in an inability to think properly, this lacks a cure. It will be mitigated to the extent that society is able to deprecate dogma and celebrate and advance those who can successfully deal with complex issues in social situations. The US in particular needs to grow up on the subjects of religion, money, and being “all mavericky and stuff” while stumping for personal positions regardless of the larger context (as though it will somehow all come out in the wash). There is no easy answer for this, but I do try to confound the stratagems of the dogmatic and laud the savvy as I’m able. #176 Phil’s description of clinical discussions reminds me of some of my experiences as a weather forecaster. Forecasting is a first cousin to climate science, being based on a combination of meteorological theory, modeling, and observations. An important difference is quick verification, so that experience can be built up more quickly. (This might resemble clinical medicine.) Also, the education bar is set lower, and a B.S. will suffice. Those of us who are serious about it continue our education, and stay up to date with relevant research. There is a well-known forecaster phenomenon referred to as “wishcasting,” where the forecaster bends the product to his/her desired outcome. The forecaster will go through ambivalent evidence, such as conflicting weather models, and come up with something that resembles their wish. Better forecasters realize that they cannot be truly objective, and look at their verification statistics for bias, as well as case studies of busted forecasts. Of course, this also leads to second-guessing. “Gee, I really think this is going to be a big storm, but I have a wet bias, so I’d better look more carefully at that drier model output to make sure I’m not fooling myself again.” Of course, this occurs both because forecasters care about their accuracy, but they are also weather geeks, and actually enjoy dramatic weather. In the context of this discussion, it is striking that a forecaster can go for years with a tendency to wishcast, and be unable to self-correct despite the evidence. Applying this to a climate scientist, there are far fewer opportunities for conclusive verification. (I just had a bad decade because of the PDO, we haven’t had a hotter year than 1998, whatever.) Somebody who is wishcasting climate sensitivity might well go an entire career without self-correcting, regardless of what part of their brain is operating in denial. I know I’m a little late to the discussion, but I thought it might be worth joining to point out something nobody’s mentioned so far on this thread. Apart from the economic (i.e., Exxon, et al. funding “skeptic” positions) and psychological (i.e. “lizard brain”) reasons for skewed poll numbers in the U.S., there is also the cultural/sociological. Was Carter congratulated for donning a cardigan? (Did I get chicks in high school by aspiring to buy a used Subaru?) Not only is conservation not socially rewarded by mainstream Americans, it’s roundly ridiculed. I’d argue also that reckless resource use is rewarded: it’s “masculine” to own a muscle-car and to own (and therefore heat or cool) a house far larger than a family needs. It’s “safer” to transport children in an SUV. And of course considerably more patriotic to drill for oil or shower upstart middle-eastern nations with cruise missiles than it is to insulate houses or take public transportation. Much of this nation’s self-image and identity is tangled up in unthinking resource-consumption. Now there are compelling reasons (the most salient of which is AGW) for everyone to think more carefully about resource use. Of *course* there’s blow-back. A narrative of careful stewardship conflicts with our basic stories about our nation, which are all about plenty and prosperity, and the ingenuity to make things of it. List the real and mythical heroes of this country: none of them became heroes by wearing cardigans. But that’s what we need now, desperately: a change in the narrative that allows for a new kind of hero who can heat a house with the sun and use his (or her) legs to get to work. And not be a wimp about a little chill in the air. “Ray, a few percent of GDP (if that’s what it is) can be a huge number.” And it will sound even bigger and scarier to the innumerate if you convert it to Yen (~80/dollar, ~115/eu), or Nigerian Naira(~157/USD). Which is exactly the sort of deceptive propaganda disseminated by vested interests opposed to rational costing of fossil CO2 emissions and any decrease in dependence on fossil fuels they sell. What percent of GDP did unregulated Credit Default Swaps and Collateralized Debt Obligations represent in financial trading? First, conservative economists told us that cutting government spending and using the money saved to fund tax cuts that disproportionately benefit the wealthy will trickle down to the benefit of everyone, but fail to account for the negative trickle down effects of hiring fewer teachers, police, and safety inspectors, or spending less on highway/bridge maintenance, and clearing trees from levees. Income of the wealthiest 0.1% of the US grew ~1.7 fold, from ~7% to ~12% of all earnings between 2000 and 2007, but average annual jobs growth was the slowest since the end of WWII. When they tell us that avoiding global warming is too expensive, I suspect they aren’t including the costs of global warming, which can grow nonlinearly. If our levees will withstand 1.5^6 cfs, but we have to open the Morganza Spillway gates above that level when the additional humidity and storm intensity from AGW kicks the flow up a notch, we pass a very expensive threshold. Economics doesn’t handle these sorts of Black Swans well. “In a separate news release, corps officials said they expect to flow less water through the floodway, based on new estimates of floodwaters moving downstream. Instead of putting 300,000 cubic feet per second into the Atchafalaya Basin, as little as 125,000 cubic feet per second might need to be diverted.” nola.com – good news for this year, but what about next time – earlier, bigger, more expensive? Is the $80 million based on 125kcfs or 300kcfs? It clearly doesn’t include the crippling of the oyster industry next year from oysters killed this year by too much fresh water. Are the costs for the second 30 days, and the third 30 days likely to rise, or decrease? 1. THE MATERIALIST MARXIST VIEW — the consciousness of the rich (and the false consciousness of the poor hoping to be rich) is based on the material conditions of the society, and this leads to climate denialism. 2. THE CULTURAL/IDEOLOGICAL DETERMINIST VIEW — it is the culture/ideology that forms the beliefs of the denialists, and they passively learn it from others. 3. BASIC PERSONALITY STRUCTURE — different child rearing practices in different cultures leads to different projective systems (like a harsh father might lead to a harsh image of God) — so it is the type of potty training, weaning, and sexual discipline in early childhood in particular cultures/subcultures/families that leads people to become denialists. 4. RAPPAPORT’S ECOLOGICAL SYSTEM APPROACH — tribes find adaptation to an environment and maintain it in an undegraded fashion through a series of cybernetic feedbacks that involves soil/etc, human and pig populations, regional political alliances/warfare, religious rituals, and the cognized model of propituating the ancestoral spirit. GW is just too slow in providing the needed feedback to make people stop degrading their home, and denialists can get by with denying GW without much negative repercussions. 5. THE HEAT-IRRITABILITY/AGGRESSION HYPOTHESIS (this is actually from my criminal justice master’s thesis student): warmer temperatures make people more irritable, cantankerous, and aggressive — they just lash out at anything that happens to come across their path, including scientists talking about global warming. This would help explain why there seem to be more denialists around today and why they are more cantankerous, as GW ensues. Sort of a positive feeback loop here. Of course, there are many many more theories, but that’s a few I could come up with in a couple of minutes. Re my #162, I take it all back, Royal Mail got me my copy of Climate Change Denial yesterday after all. Re: lizard brainstems (Rasmus’ OP, my #65, and others), I think we can lay that one to rest. Far as I can see, p. 101 of the book has a one-line cautiously worded reference to some author making an argument of that sort. It does not really figure at all in the book’s wide-ranging survey of psychological, social and political causes of denial. I don’t think it’s fair to compare climate deniers to reptiles. We should show more respect our scaly (and feathered) friends; after all, they’re not the ones pushing junk science. Destined for extinction, like their forebears. I agree with the person who said we need more psychology, not more science to refute the propaganda used by deniers. While most of this is energy-focused, it is what we are actually discussing when we talk about the effects of GHGs. You will find the concepts broadly applicable to the issues discussed here. I’d very much encourage RC to invite him to post here with a more climate denial/how do we manage this crisis spin. I was going to offer such a post but have never gotten around to it. The recent tornado and high moisture events get the usual media treatment. as some sort of “thing from Canada” , that is the only way they describe it. All the while the formation and in particular variation on how cold it gets up in the higher atmosphere is seriously dealt with by science papers, these get the scant attention they don’t deserve, a brief 300 word explanation next to to car ad. Thank goodness for RC, may this site prosper further. I am now reading “The Great Disruption” by Paul Gilding. He talks about how Churchill got nowhere until Hitler invaded Poland, and the US remained pacifist until Pearl Harbor. Then everybody changed suddenly. Gilding thinks such a change will happen with GW some time in 2018, if I remember correctly. Around page 157: Paul Gilding gives classes to CEOs in which he talks about GW. Paul Gilding keeps saying that soon there will be a sudden reversal of the common person’s attitude and then there will be a WW2 level of effort to stop Global Warming. Yes, I know that capitalism has also worked wonders. But, “The Great Disruption” by Paul Gilding also says that the business model must change. Exponential growth of any kind on a finite planet cannot continue for long. They will keep battering themselves by running into the wall. It will take a long time for the CEOs to realize that they must change the system. You can only work wonders until you run into the wall. It would help if journalists would do their jobs. I see glimmers of hope in stories like “Meteorologist on Severe Weather: ‘We Have Never Seen a Year Like This Before'” shown on PBS earlier this week. However, I think it’s about time for some unrelenting exposés of organizations and people like Inhofe who provide such vicious disservice to the public.